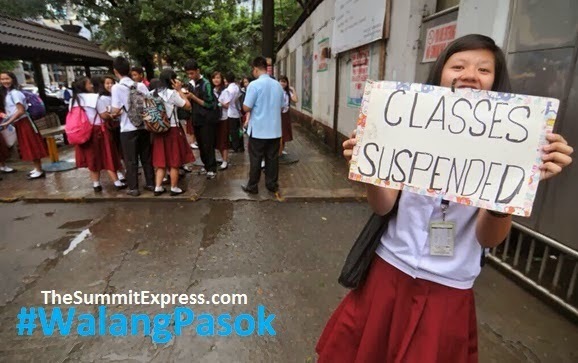 MANILA, Philippines - Some local government units (LGUs) and schools in Metro Manila and Luzon announced class suspensions for today, October 2, 2015 (Friday) due to the effects of Tropical Storm 'Kabayan' in the country. State weather bureau PAGASA on Friday morning said that 'Kabayan has made landfall over Baler-San Luis, Aurora and is now traversing Central Luzon. PAGASA raised Public Storm Warning Signal No. 2 (61-120kph Expected in 24 hrs.) over the areas of Aurora, Quirino, Nueva Vizcaya, Nueva Ecija, Benguet, La Union, Pangasinan and Tarlac. The list above is based on online monitoring. We will update this list as soon as new announcements are made or reported. For areas and schools not on the list, it means there is no announcement yet. 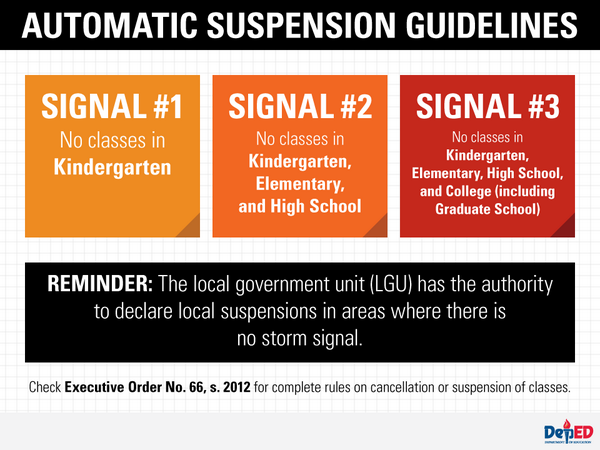 It is reminded that the local government unit (LGU) has the authority to declare local suspensions in areas where there is no storm signal.